Clarke County voters are dominant in Georgia House District 117 and make up a very slight majority of voters in the 119th Georgia House District, an analysis of voter registration data as of Oct. 1 shows. Clarke County voters also differ demographically from those in Barrow, Jackson and Oconee counties, who share the 117th, and from voters in Oconee County, who share the 119th, the analysis of the registration data confirms. Early voting starts today in the two special elections to fill the vacant 117th and 119th Georgia House seats, and the two candidates in the 117th and four candidates in the 119th have to persuade voters to vote for them and to turn out at the polls if they hope to represent the area in the General Assembly session in January. All six candidates have the opportunity to meet with potential voters tomorrow night in a candidate forum at the Oconee County campus of the University of North Georgia and in a forum the 23rd at the Athens-Clarke County Library. The Oconee County Area Republicans will be hosting Steven Strickland, a Republican candidate in the 119th House District, on Thursday at the Oconee County Library. Clarke County makes up 56.4 percent of the registered voters in House District 117, compared with 23.1 percent for Oconee County, 11.3 percent for Jackson County, and 9.1 percent for Barrow County. In the 119th, Clarke County has 50.3 percent of the registered voters, and Oconee County has 49.7 percent. The Secretary of State Office releases voter registration data for all of the state’s 159 counties at the beginning of each month. I downloaded those data last week and sorted out the data for the 117th and 119th House districts. Voters could continue to register and be eligible for the Nov. 7 special election through Oct. 10, but those data will not be available until Nov. 1. It is unlikely that the figures would have changed radically during that time period. Both of the candidates running in the 117th House District race are from Clarke County. Houston Gaines, running as a Republican, graduated last year from the University of Georgia, where he was Student Government president, and is part of a prominent Athens family. Deborah Gonzalez, running as a Democrat, is an Athens attorney specializing in music and communication technology issues who also has held positions at the University of Georgia. All four candidates for the 119th are from Oconee County. Tom Lord, who owns a local funeral home, Strickland, who does business development for a technology services company, and Marcus Wiedower, a custom home builder, are running as Republicans. Jonathan Wallace, a software development manager, is running as a Democrat. If none of the four candidates for the 119th gets more than 50 percent of the vote, the top two will meet again in December in a runoff election. House District 117 was cobbled together in the 2011 redistricting by the General Assembly, dominated by Republicans to make the seat safe for then incumbent Doug McKillip. McKillip ended up losing in the primary to Regina Quick, who has been appointed a Superior Court Judge, forcing the Nov. 7 special election to fill her unexpired term. The 117th is 53.3 percent female, based on the registration data. The parts of Clarke County in the district have the highest percentage of female voters, followed by Oconee County. Female voters tend to vote more Democratic and have been particularly critical of President Donald Trump. A large number of voters are classified as “Unknown” in the state records, and that figures is highest in Clarke County. White, non-Hispanic voters tend to vote more Republican and to be more supportive of President Trump. House District 119 is 52.7 percent female in voter registration, but 53.7 percent of the registered voters in the district from Clarke County are female and 51.7 percent of the voters from Oconee County in the district are female. Overall, 74.4 percent of the registered voters in the 119th are classified as “White not of Hispanic Origin,” but the figure is 64.6 percent in the Clarke County part of the district and 84.3 percent in the Oconee County part of the district. Blacks who are not Hispanic make up 15.6 percent of the 119th District voters from Clarke County but only 3.6 percent of the voters in the 119th from Oconee County. In both the 117th and 119th, the diversity of Clarke County is lessened by the addition of the other counties that make up the districts. 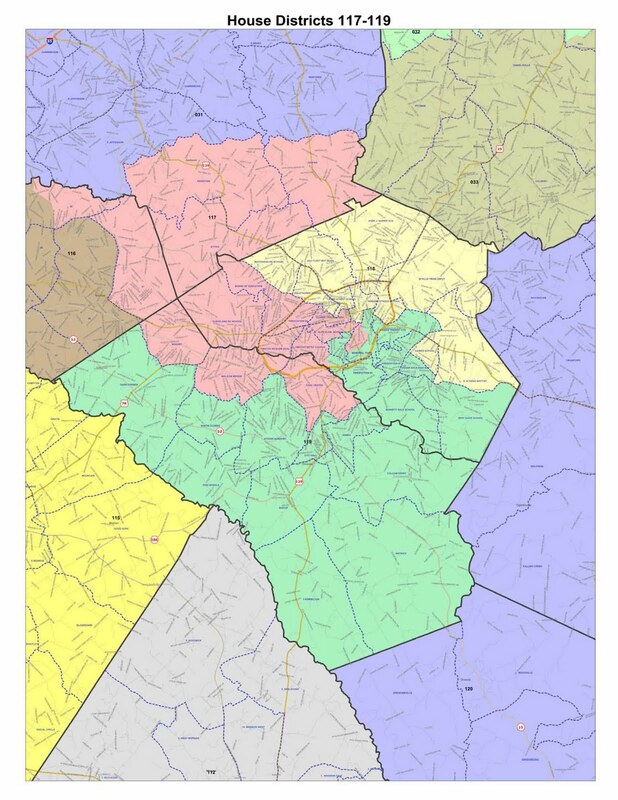 The three precincts from Oconee County that make up the 117th–Athens Academy, Malcom Bridge and Bogart--are more diverse than the remainder of the county, which falls into the 119th, but they still work to offset the diversity from Clarke County. House District 118, which is entirely in Clarke County, has a higher percentage of female voters than either the 117th or the 119th and a considerably lower percentage of “White not of Hispanic Origin” voters. Black voters who are not Hispanic make up 33.4 percent of the registered voters in the 118th, compared with 15.4 percent in the 117th and only 9.7 percent in the 119th. Wallace in particular emphasized at the candidate forum last week that door-to-door campaigning is a key part of his effort. He has no Democratic opposition in the free-for-all election. The candidate forum at the University of North Georgia, which starts at 6 p.m. tomorrow night, is being organized by the student government there in collaboration with the Republican parties of Athens-Clarke County and of Oconee County. Wallace as of last week had not committed to being there, nor had Gonzalez. The Oconee County Democratic Party is holding its monthly meeting at 6:30 p.m. tomorrow night at the Oconee County Chamber of Commerce, where R.J. Hadley, a Democratic candidate for Secretary of State, is scheduled to speak. The meeting of the Oconee County Area Republicans, a group separate from the county Republican Party, is scheduled to start at 6:30 p.m. on Thursday at the library. The county also has a Utility Department meeting with the public at 6 p.m. on Wednesday at Oconee Veterans Park followed by a Town Hall meeting at the same venue at 7 p.m. Subcommittees of the Comprehensive Plan Stakeholders Committee are meeting at 6:30 p.m. on Tuesday at the Annex on the south side of Watkinsville and at the same time on Thursday, also at the Annex. The city of Watkinsville will meet Wednesday. There's a special called meeting at 6 p.m. to discuss the possibility of establishing a city manager position. Then there's a regular meeting at 7 p.m. According to the county government web site, the town hall is at 6 pm Wednesday? Perhaps they are incorporating the Utility meeting into the town hall? The meeting of the Utility Department was called for 5 p.m. The Town Hall meeting is to start afterwards, according to the original announcements. The county web site does not list the two separate meetings, but I believe these are the correct times.